Does your young child experience anxiety at school? Many children find it difficult to adjust to the school routine at first, mostly because they don't like being away from their parent/s. 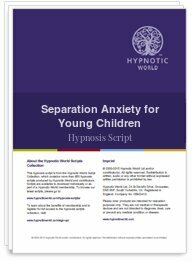 This Separation Anxiety for Young Children script uses a gentle approach that is suitable for 4 to 6 year olds. Because children of this young age don't necessarily need hypnosis this script is based on an adapted fairy story that most young children will be able to relate to - however it contains a therapeutic solution to overcoming their problem. Children will love the adorable characters in this story and will be able to look forward to being at school and having the opportunity to learn and play. Ease Away Anxiety and feel Calmer Today. Help your child to overcome their anxiety.